Our second week in New Zealand started in New Plymouth. Here we were meeting my parents who had just travelled the South island. It was very nice to see them again after more than 9 months! Our goal in New Plymouth was the impressive volcano overlooking the city: Mount Taranaki (1500m dislevel, 7-8h). 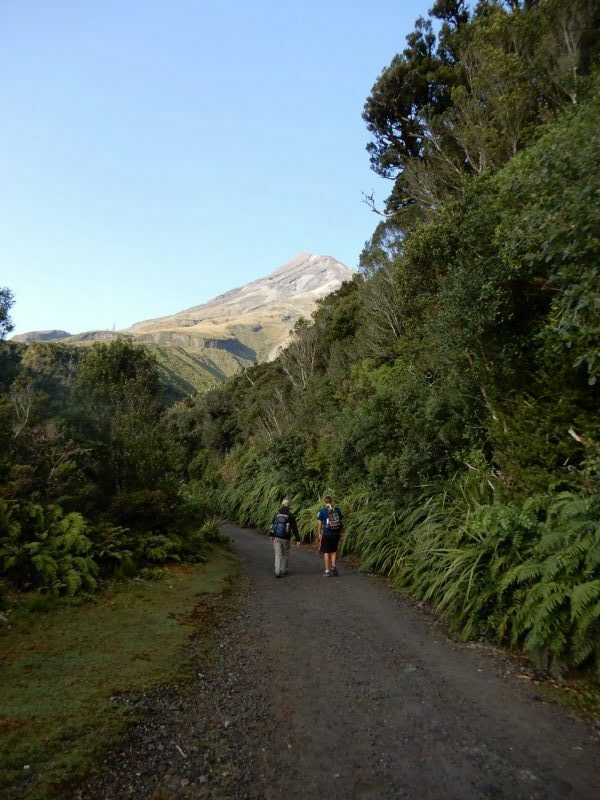 Mount Taranaki is an active volcano and rises 2518 metres above sea level. The day we decided to hike the mountain, it was very cloudy outside and we weren’t quite sure if we could even start our hike at all. But once we reached the visitors centre, we saw that the summit was completely clear of clouds and the sun was shining. Speaking of a micro climate! We started the hike and immediately noticed that the hiking trails in New Zealand are very different from the European ones. 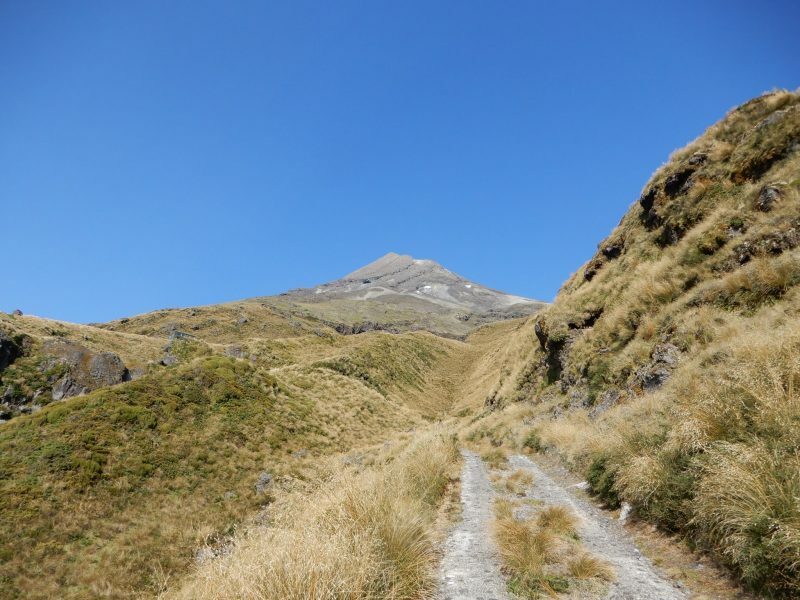 In Europe, the trail usually slowly zigzags up the mountain while in New Zealand, the trails seem to go straight up. Our calves were burning by the time we reached the hut (about ⅓ of the whole hike). My mom decided to call it a day here while Simen, my dad and I decided to continue. However, once we left the hut, the wind started howling and the trail turned into hundred flights of stairs. After about 45 minutes, Simen and I also decided to go back. My dad continued going until it got so windy he had to climb on all fours. Only then, he figured it would be best to also go back down. After Taranaki, we drove to National Park Village. 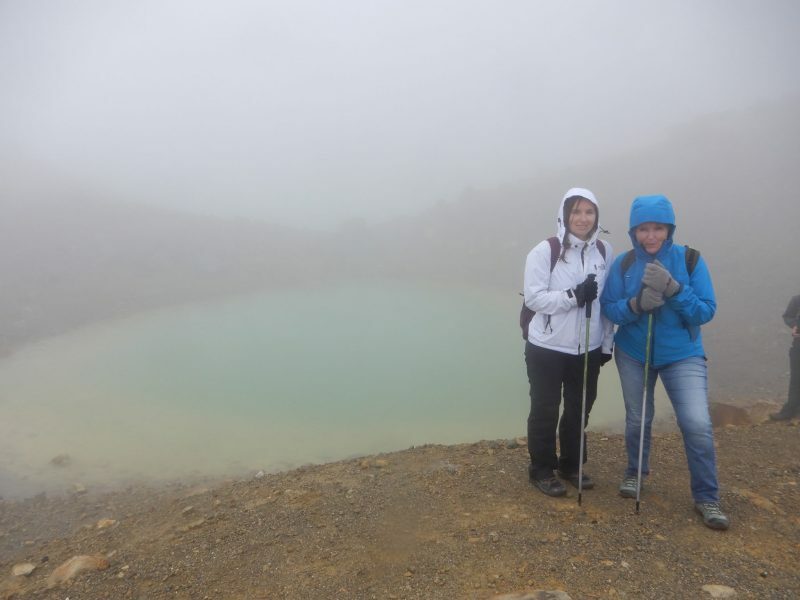 Here, we wanted to hike the Tongariro Alpine Crossing. This hike was named the best one day hike in the world! 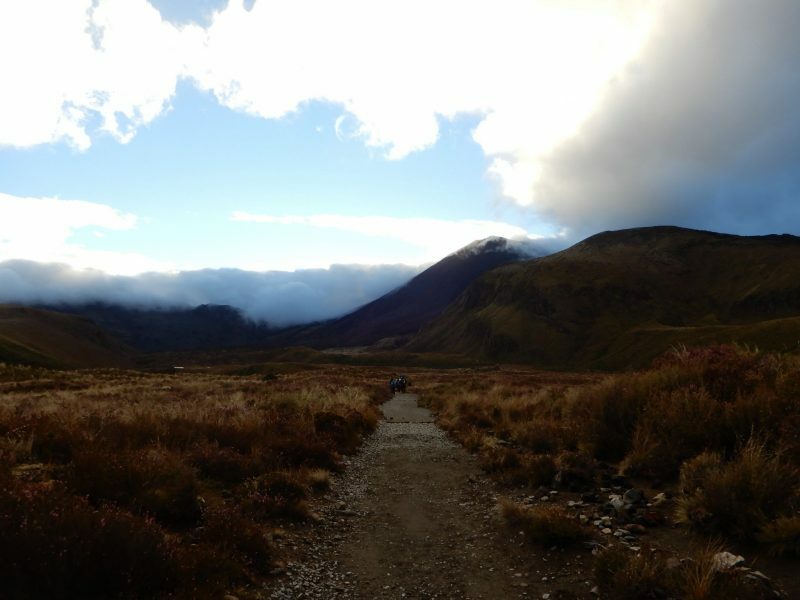 Plus, it was also used as a film location for Lord of the Rings, since it’s home to the ominous Mount Doom! Because the weather forecast had said that Sunday would be the best day to do the Crossing, we stayed close to the Lodge on Saturday. We spent the day exploring one of the cities close by and playing mini golf, in the glaring sun! Sunday, on the other hand, was clearly not the better day of the two. 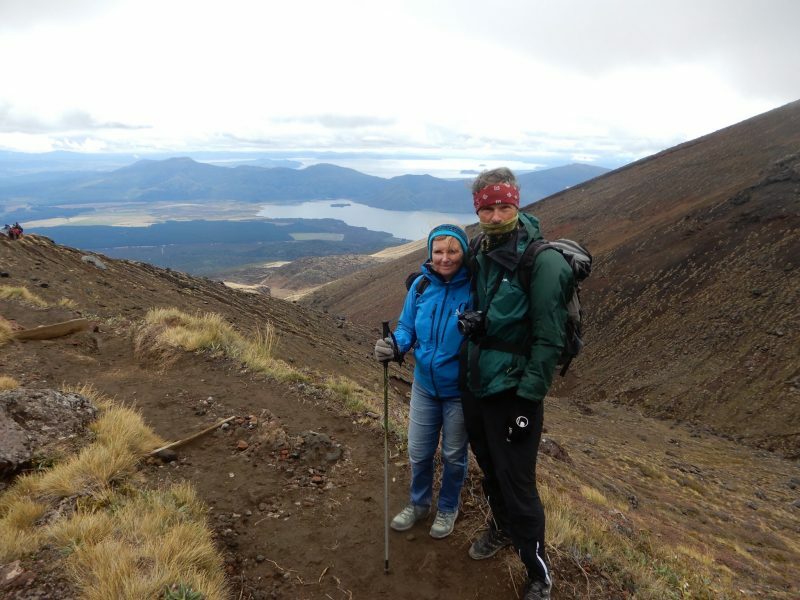 Only on the way down did the skies clear up and we got to see Taupo and Lake Taupo, which was very beautiful! This was also our next stop. 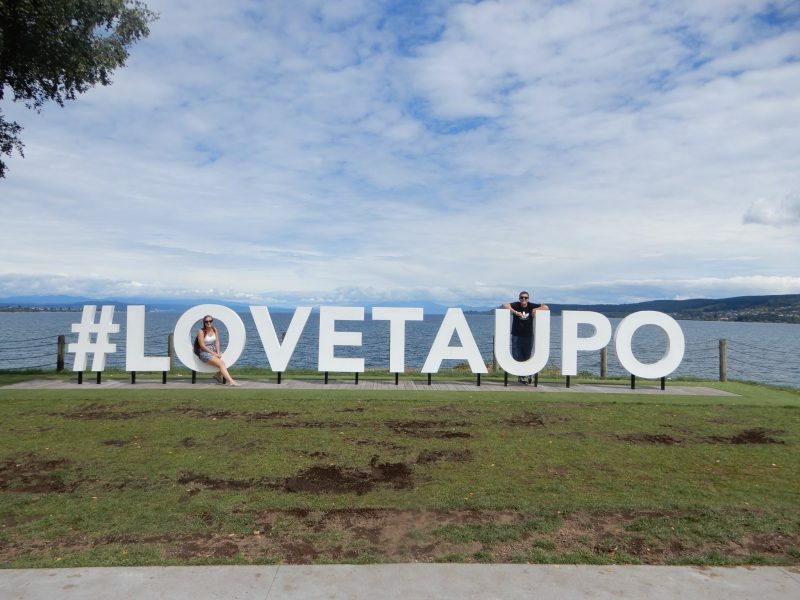 Taupo is the adventure capital of the North Island, which becomes clear when you see what’s on offer here: parasailing, paragliding, rafting, jet skiing, skydiving, etc. 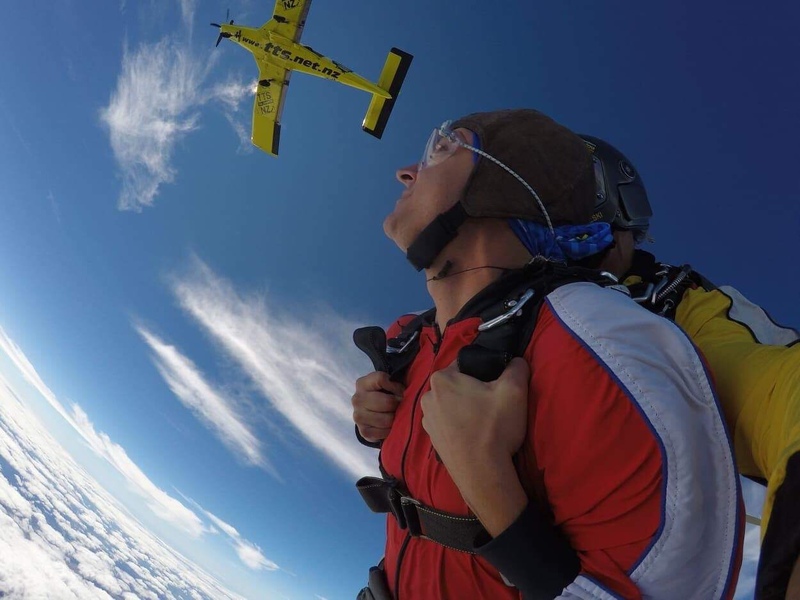 Simen channelled his inner Daredevil and decided to go skydiving. 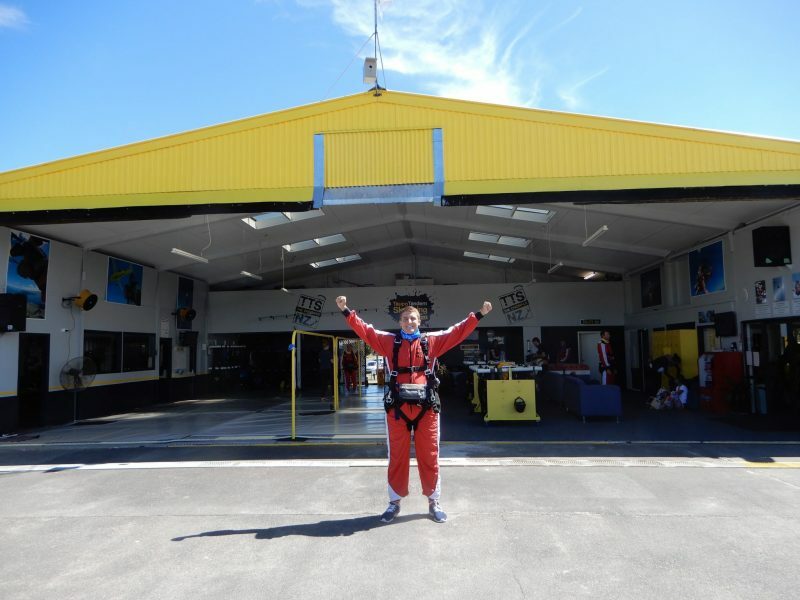 Because I wasn’t entirely convinced, we went to the Taupo Tandem Skydiving office for some reassurance. The TTS team was super friendly and eased all of my worries. So, Simen signed up for a jump. And not just “a jump”, the highest jump they had on offer: 18.500 feet (5500m) and 75 seconds of freefall! The next day we drove back to the airport, both very nervous. To be honest, I think I was even more nervous than Simen. Once we arrived he signed some waivers, had a safety briefing, and was ready to get on the plane. It was very weird seeing him leave on that plane, knowing he wasn’t coming back with that same plane. 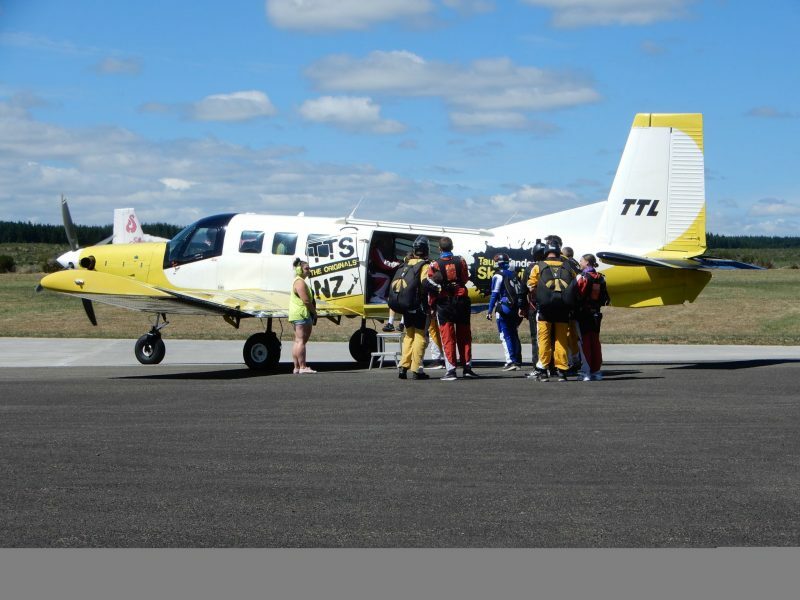 After 30 very long minutes, one of the TTS employees told us it was time for the 18.500 feet people to jump. I knew that Simen was going to jump first, so I kept my gaze fixated on the plane. Suddenly I saw a tiny white spot, not bigger than a tiny, tiny ant, falling down. I knew it was Simen and it was very weird to realise he was now freefalling, straight down! After 75 seconds of pure stress, the parachute finally opened and I could breathe again. Simen arrived back on planet earth with a big smile on his face. Despite not loving the freefall that much, he really liked the actual parachuting. And I really liked seeing him with both feet on the ground again! 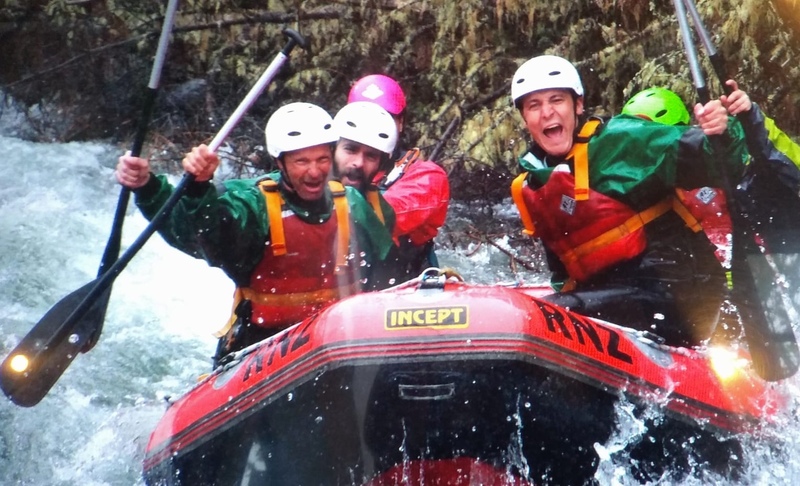 As if jumping out of a plane wasn’t enough adrenaline for a lifetime, the very next day Simen and my dad signed up for rafting. They were going to be on the water for more than 2 hours. For Simen it was the 2nd time (after trying it out in Ecuador), while for my dad it was the first time ever. They both really loved it and said that it never felt like 2 hours and time just passed by like that. 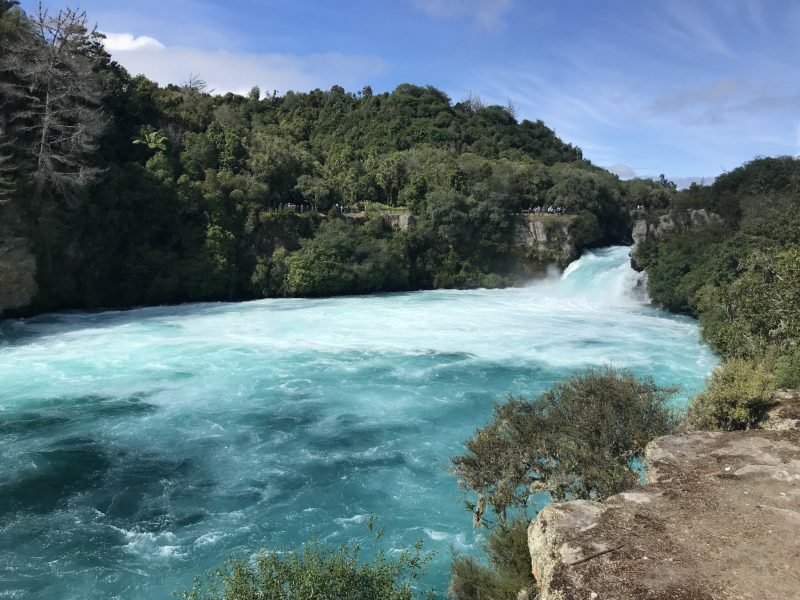 On our last day together, we decided to go to the Huka Falls. You can easily drive to the falls, but we decided to walk there. The walk leaves from the natural hot springs and only takes about 1h to get there. The Huka Falls are the most photographed natural phenomenon in New Zealand, which explained the hordes of tourists. The falls are really beautiful and have an amazing blue colour. After our quick hike to the falls and back and a lovely lunch, it was time to say goodbye to my parents. They had to fly back to Belgium, while we continued our trip towards the South Island. More about that in my next blog! 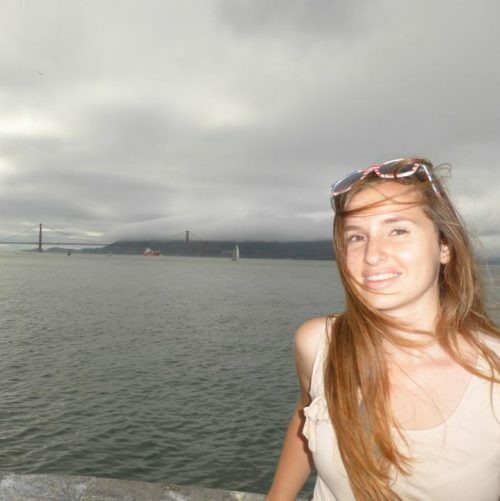 Read my previous post “New Zealand Road trip: Week 1” here.